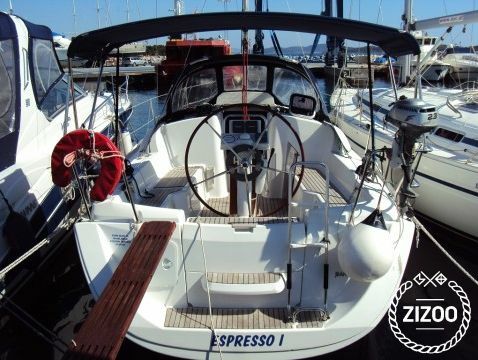 This boat is an example of keeping things simple, at the same time ensuring the comfort you expect from a cruising boat. For instance, the deck layout is incredibly clean, with all halyards being led to the port side of the gangplank. Sheets are led to just two cockpit winches, both within easy reach of the captain. You know why this is brilliant? This means that whoever is the skipper in your crew, they can sail the boat by themselves, and you get to kick back on the deck and work on that tan! Clever, isn't it? We thought you might like that! Prepare some cold drinks for your crew and just relax as you sail from island to island, looking for that perfect swimming spot. Her transom with the swim ladder will provide easy sea access, so you can go for a dip anywhere you feel like anchoring. Bring your snorkelling set to explore the colourful underwater world, the Adriatic is one of the cleanest seas in the world!